Maine is not known for its poker rooms. There is just one place to play live poker in Maine. There are no other live poker rooms within a reasonable driving distance either. Luckily there are no laws preventing players from enjoying online poker. There are no laws that address online poker in Maine. It is not regulated, nor is it specifically illegal. 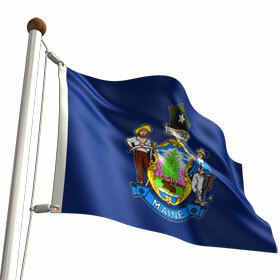 This means that all online poker rooms that accept U.S. players are available to Maine residents. Where Can You Play Online Poker in Maine? The largest online poker room available to Main players is Bovada.lv. It is the U.S. facing brand for the Bodog Poker Network. Bodog has been in the online gambling business for over 15 years, 10 of which it has offered online poker – mainly through their Bovada brand, which is USA-only. New players receive a 100% up to $1,000 first deposit bonus. There are also regular tournament series, large weekly guaranteed tournaments and cash game promotions. Bovada has a few quirks that may bother regular players. There are no screen names or waitlists at Bovada. These features help keep weak players in the game longer and make the game quality better. Some experienced players may be annoyed by them though. Another great choice for Kentucky online poker players is Carbon Poker, which is the flagship of the Merge Gaming Network. New players will receive a 200% up to $5,000 bonus. There is also a lucrative VIP program, monthly reload bonuses and a Royal Flush bonus where players can win 100 times the big blind by using both hole cards. There is also a regular tournament series known as Poker Maximus. There is only one live poker room in Maine. It is the Hollywood Casino in Bangor. There are six tables in the poker room. Most games are 2/4 Fixed Limit Texas Hold’em, although the room will also spread Omaha, Omaha High/Low and Seven Card Stud. Players can find poker in New Hampshire, but there is a $4 bet limit for cash games. Tournaments with any buyin are offered throughout the day to make up for the lack of cash games.